If you are experiencing problems such as being logged out immediately after logging in, an extension or add-on in your web browser may be causing problems with MyChart. Use the links below to learn how to disable extensions and add-ons in some of the most popular web browsers. If disabling extensions and add-ons does not resolve your problem, try clearing "Cookies" in your web browser using the instructions below. Finally, if you are still having problems, try installing a different web browser. There are links below to download the latest version of each web browser. Click the Tools icon located at the top right of your browser. It looks like this: . In the Tools menu, click "InPrivate Browsing" or "Safety > InPrivate Browsing". A new window will open in a "Private Browsing" mode in which "toolbars and extensions are disabled by default." 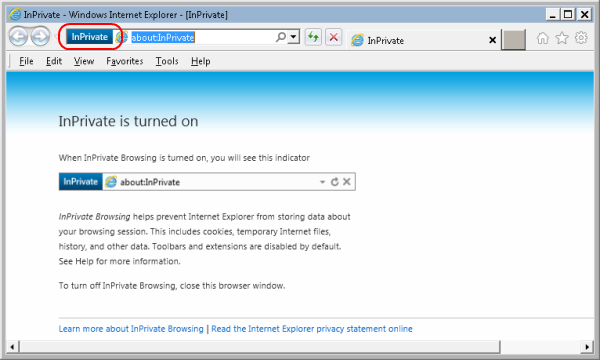 Learn more about InPrivate browsing at the Microsoft web site. If disabling extensions and/or add-ons didn't work, try clearing your cookies using the instructions at the Microsoft web site. On that page, there is a drop down menu towards the top right that lets you change the instructions based on the version of Internet Explorer. Need the latest version of Internet Explorer? Get it here. Click the Menu icon located at the top right of your browser. It looks like this: . In the menu, select "New incognito window". A new window will open in an "Incognito" mode in which "all extensions have been disabled." 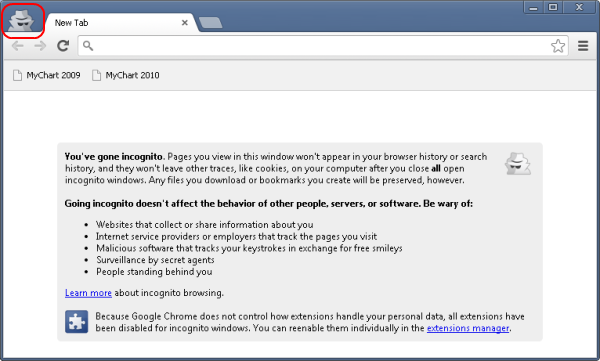 Learn more about Incognito mode at the Google web site. If disabling extensions and/or add-ons didn't work, try clearing your cookies using the instructions at the Google web site. Don't have Chrome but want to try it out? Get it here. In the menu bar at the top of the window, click File > New Private Tab. A new tab will open in an "Private" mode and by default, extensions do not interact with private tabs. 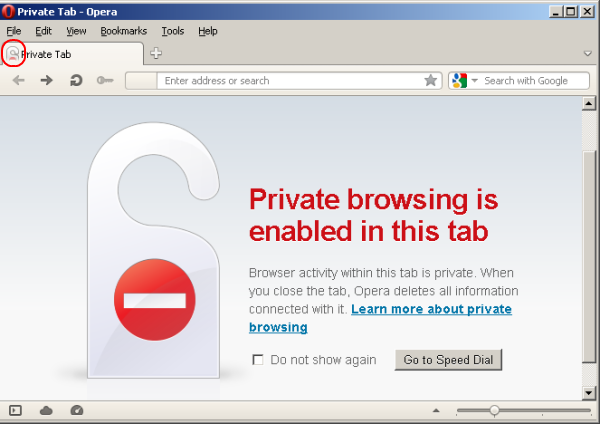 Learn more about extensions and private tabs at the Opera web site. If that didn't work, try clearing your cookies using the instructions at the Opera web site. Don't have Opera but want to try it out? Get it here. 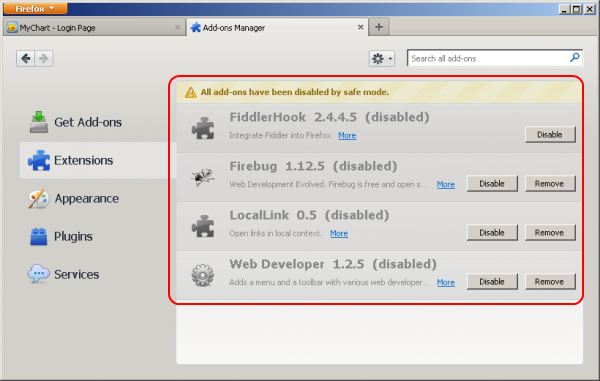 Although FireFox has a "Private" mode, Firefox does not disable add-ons by default in private mode. Instead, you must restart the browser in a safe mode. Click on the "Firefox" button, and select Help > Restart with Add-ons Disabled.... Or if you are in Menu-On-Top mode, select Help > Restart with Add-ons Disabled... from the menu. FireFox will restart and prompt you to "Start in Safe Mode" or "Reset FireFox". Choose "Start in Safe Mode" to temporarily disable your add-ons. Learn more about Safe Mode at the Mozilla web site. If that didn't work, try clearing your cookies using the instructions at the Mozilla web site. Don't have FireFox but want to try it out? Get it here. Although Safari has a "Private" mode, Safari does not disable add-ons by default in private mode. However, Safari has a very simple setting to turn off all extensions. Click on the Tools icon. It looks like this: . From the Tools menu, select "Preferences..."
In the "Preferences" window, select "Extensions" and choose the "Off" option. Learn more about managing extensions in Safari at the Apple web site. If that didn't work, try clearing your cookies using the instructions at the Apple web site. Don't have Safari but want to try it out? Get it here.